With over 5000 dogs injured in road accidents each year, the I Can See Dog Car Seat is a car booster seat that helps keep your dog secure and comfortable in the car, whilst also providing small dogs with the chance to do what they love most – sit up and look out the window as the world goes whizzing past them on a car ride. I know Darcy is forever wanting to get up and see where we are off to so it’s a great way for him to either kick back and relax or feel the wind in his hair with the window down. It also doubles as his bed when we take a dog friendly weekend escape and, for me, the best thing is that it keeps him from spreading his wiry hair throughout the car so I might have chance to arrive somewhere without wearing his fur as a coat! Not all car booster seats are made equal, many cheap imports from China fall apart pretty quickly which is why Helen the Founder of the I Can See Dog Car Seat decided to hand make her own right here in Australia. As each car booster seat is hand made, the material can be individually tailored to suit your dog’s personality. From a modern and sleek design to wild animal prints, faux fur, suede or water resistant canvas linings, the choice is yours. Helen also loves sourcing fabric for special requests including breed themed fabrics from the USA featuring poodles, cavoodles, maltese, pugs and dachshunds to name a few! The covers can be removed for washing and, when you feel like a change of design, so you can simply buy a new cover rather than a whole new seat! The seat structure is made from high quality foam, so it is surprisingly lightweight and doesn’t need any special or permanent fitting. You simply secure it with a car seat belt and then use the strap that it comes with to attach the seat belt to your dog’s harness. 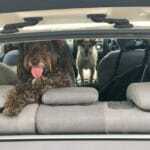 This helps to ensure you are following the various state and territory legislative requirements of either keeping your dogs either restrained, or at least not obstructing the driver depending on where you live and travel. The I Can See Dog Car Seat can also help with dogs that might feel motion sickness by allowing them to see the landscape and also be closer to the fresh air. The car booster seat is to be placed in the back seat as having dogs in the front puts them at risk of injury from the air bag in the event of an accident. As it is not a car crash safety seat, you should ensure that the car harness you use is one that has been put through the appropriate car safety tests so that your dog can then be both safe and comfortable at the same time. Double 70 cm = 2-3 small dogs or 1 medium dog. Darcy has a Medium car booster seat in the photo so that he can share it with his best friend Harvey when he comes to stay. Prices start at $209 including GST and will take about 2 weeks from placing your order to be shipped from Helen’s home where she makes them with love!